At the risk of the cliché ‘rain dance’ the Soaring Eagle dance workshop on April 25, 2012 was successful in spite of the predicted precipitation this Wednesday. This evening began with a congratulatory talk for the dancers, by Chuck Cadotte, on the fine presentation for Dalai Lama at the SDSU Viejas arena. We made it home missing the wet roads and added hazards of the night. announcements of community events and upcoming pow wows. There was a fine healthy mixed vegetable potluck: rice, AIWA provided pepperoni pizza, grilled mixed vegetables and fresh slaw. Later we had donuts and punch. We acknowledge and appreciate all parents and folks are ready to have a good generous time doing this potluck thing for the children. 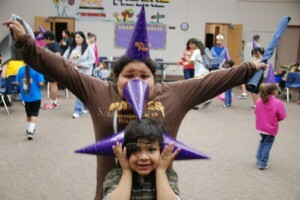 Our focus for the Soaring Eagle program is always the children. 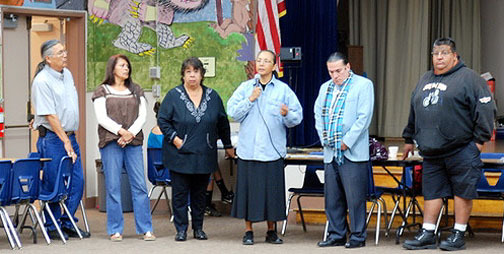 Our most democratic and teaching drum group: San Diego Inter-tribal singers were most pleased to set the dancers toes tapping. Ben brought in some bells for the students to enjoy and better find the rhythm of the drum. It is all a good thing we do for the children. For many looking on there was a faraway look in their eyes. As they heard the sound of the bells and songs and where they might have been when they heard the sound of the drum and Indian songs in the winds of times past. Old friends and children who are learning the songs and drum protocol gathered around and joined in with enthusiasm. 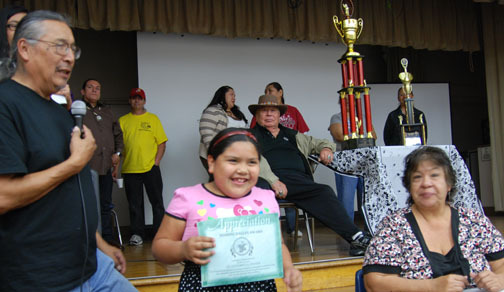 Parent and friends participation are very important to the Tribal social aspect of the program success. Remember to bring a potluck item or side dish for the Soaring Eagles dance workshop evening feast. It is our Traditional Indian way to practice hospitality and generosity when we invite all to attend the next Indian gathering and share the meal with the whole community. 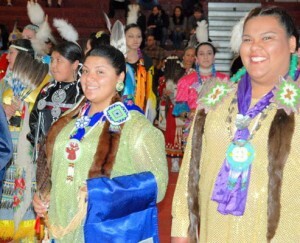 The Soaring Eagle performance dance group will be very active over the remainder of the 2012 spring. For Soaring Eagle, contact: Vickie Gambala 619-306-7318. 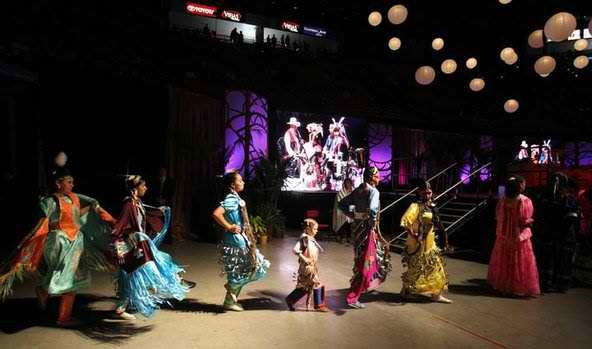 At the request of the Dalai Lama, April 19, 2012, local tribal Chairmen, singers and the Soaring Eagle children and dancers were at SDSU Viejas arena. Paul ‘Jr’ Cuero blessed the arena in anticipation for the spiritual context and message of the rest of the day. Local Kumeyaay Tukuk ‘Bird’ singers and dancers from the Campo Reservation presented songs and Kumeyaay traditional culture. Additionally the Dali Lama blessed the gourd rattle being used by Paul. 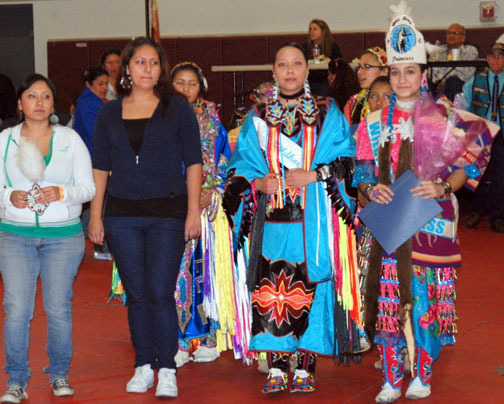 Following the Kumeyaay presentation the Soaring Eagles took the stages for the popular categories of Pow wow dance excitement. All enjoyed the children and adult dancers in beautiful regalia, feathers flying and bells ringing dancing with joy and pride of representing Native American culture. The Dalai Lama has left San Diego but everyone is welcome to enjoy the Soaring Eagle program. 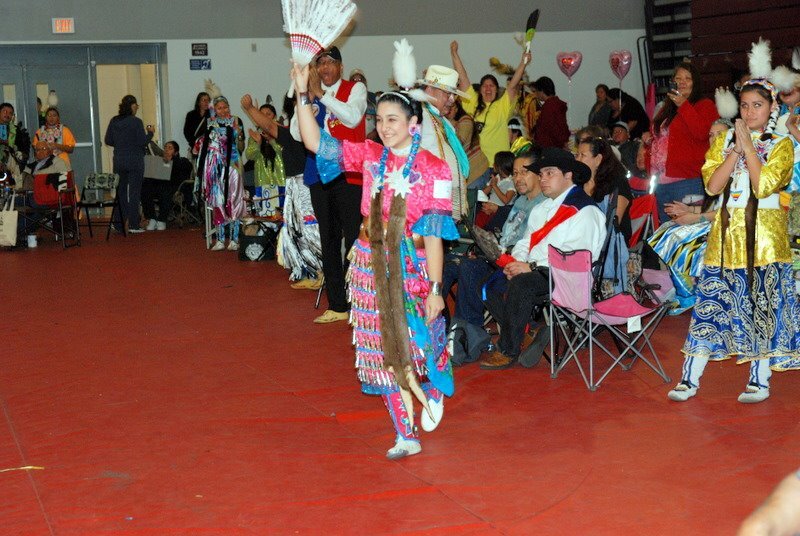 It provides Native American/Alaskan Native, K-12 students with an opportunity to learn traditional dance, regalia and respectful tribal customs. There are many entertaining and healthy activities for all ages and interests to enjoy. 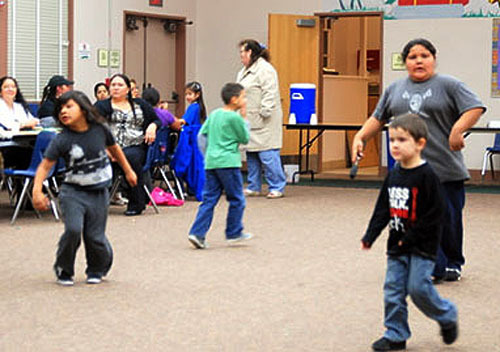 The Soaring Eagle American Indian Children dance program is located in Old Town in the Ballard Parent Center. It serves as the home of San Diego Parent advisory committee. This is where parents learn how to strengthen their parenting skills, become more involved in their children’s education and improve their ability to communicate with their children. For more information please call Vickie Gambala 619-306-7318 or E-mail vgambala@cox.net. Thank you, Aho, Mehan. Our focus for the Soaring Eagle program is always the children. This dance workshops enthusiasm and quality is evident in the initiative, joy, pride of tribal identity and participation in the songs and dance categories. 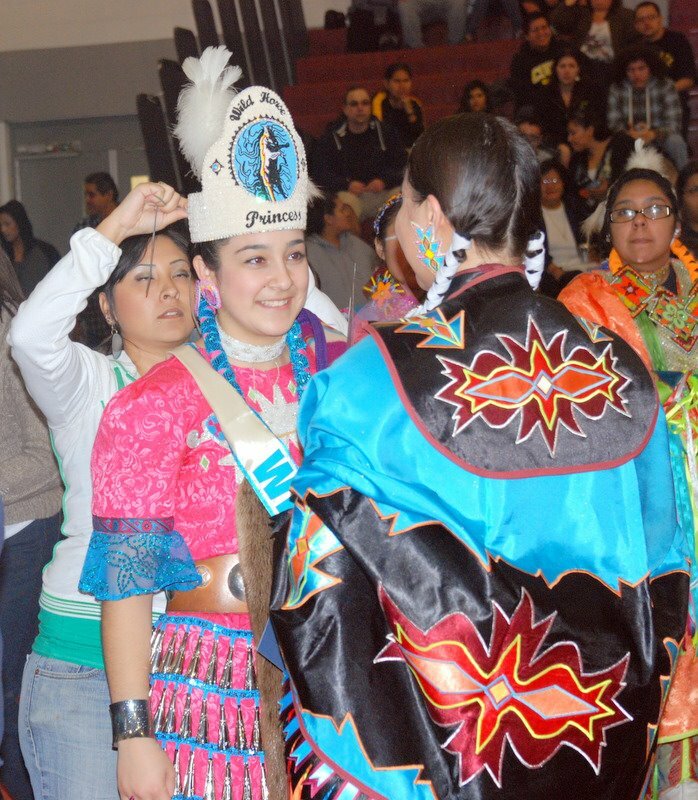 This was reinforced by the presentation of the Carla Tourville filmed DVD of the SDSU pow wow last month. 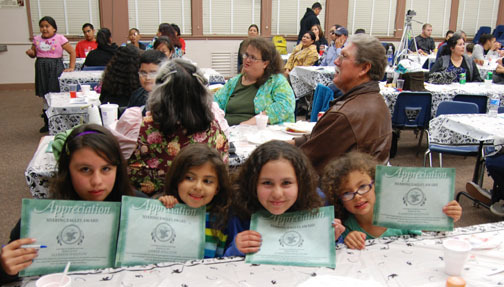 Multi-copies were distributed to the Soaring Eagle parents. We continue to have new families and old friends arrive for a fine dance workshop this Wednesday April 11, 2012. Also, from the beginning of the evening to the end the Soaring Eagle, parents and children invitation to be a part of the Native American April 19, 2012 presentation for the Dali Lama continues to be a part of the structure of the dance workshop. Also announced is Earth Day celebration at the Rincon reservation on the 13th of this month. With this in mind the SCAIR tutor Jeanie Alvarado brought in two booklets: Earth Day workbook and the Force of Water. Water is a most relevant issue to Tribal America! 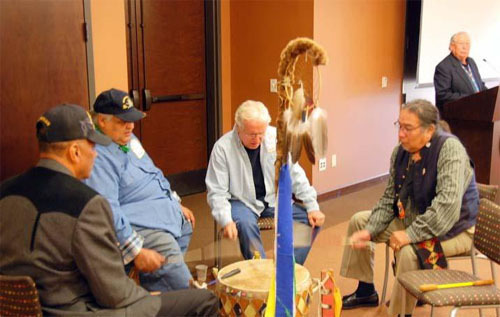 On April 5, Senators Jon Kyl and John McCain met with tribal leaders in Tuba City to urge them to move quickly on a proposed settlement of water-rights claims. Approximately 200 came out to protest Senate Bill 2109 titled “Navajo-Hopi Little Colorado River Water Rights Settlement Act of 2012.” Don’t miss the April 11 edition of the Navajo-Hopi Observer for the full story. Accompanied by bodyguards, they did not stay long after they were booed, hissed and jeered by Hopi, Navajo and non-Native crowd. A protest erupted, with the crowd showing their displeasure with the two senators’ closed meeting discussions with Hopi and Navajo leaders over one of their most precious tribal resources - water. While Navajo Nation President Ben Shelly was finally forced to take public responsibility for initiating the northeastern Arizona visit by Republican Senators Kyl and McCain via a press release issued on April 4, the Navajo portion of the senatorial visit was to urge Navajo council delegates to move quickly to help push through the water rights settlement agreement through Congress before this session and Kyl’s term of office ends. However, in a press release issued by Hopi Chairman Leroy Shingoitewa on April 6, Shingoitewa continued to claim that the Hopi portion of the senatorial visit was only to discuss “items of concern” not related to the Little Colorado River Water Settlement agreement. “Then why all the secrecy? Why the closed doors to the Hopi and Navajo public and why can’t we as Hopi and Navajo members be allowed to listen in on these senate visits when it’s our water and our communal concerns that are being discussed? If it’s nothing to alarm us, there should be complete transparency,” said Martha Berman. Berman is a Navajo member from Canoncito (To’haajilee’) area near Albuquerque who drove with her sister the night before to be at the joint tribal Tuba City protest against the Little Colorado Water Rights Settlement agreement. SB 2109, introduced by Kyl in February, would require that both tribes “waive” all claims to the Little Colorado River water in exchange for three groundwater projects that would deliver drinking water to homes on both Hopi and Navajo who currently don’t have running water. The senators both admitted that their plan needs full tribal approval before they can go forward. “How are seven meetings going to help us? We have over 100 chapters and many Navajos do not have access to vehicles to get to these limited seven meetings. If Ben Shelly or Rex Jim really wanted to hear from all of us, then they need to go to every single chapter even if that takes more time and money and translation from English into Navajo. That’s how important this water issue is to us,” said Benally. “While Kyl, McCain, Shingoitewa and Shelly say they will provide much needed water to our communities, the groundwater projects for our people will come at a great and much more far reaching expense than just money. They also want us to forever extinguish and waive our future claims over our water rights and water quality, which will result in loss of our traditional values, culture, ceremonies and our sovereignty,” said Nuvamsa. Both Hopi and Navajo tribal officials are now having to “back-pedal” on their preliminary senatorial “agreement in principle” that was referenced on a Feb. 17 letter from Jon Kyl to Sandy Fabritz-Whitney, director at the Arizona Department of Resources. The letter references “minor tribal issues that must be resolved” because the bill requires full tribal consent. Heavy police presence from federal, tribal and Department of Public Safety officers at the peaceable protest also was a concern for both tribes’ members who wanted to be heard and visible against the Kyl and McCain visit. “I was not even afforded the respect as a former Hopi chairman and long-time Hopi advocate of water rights, to listen in. I was instead shoved out of the meeting, knocked down and to make it worse, I was asked to leave the restaurant after sitting down inside to get something to eat by the restaurant manager. Who treats their own people like this? 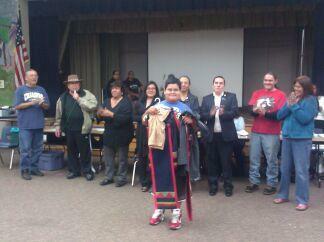 We are here to have our own voices heard about water and that is not being honored,” said Masayesva. “Let’s see how accountable and honest Shingoitewa and Shelly are going to be, since we all heard and witnessed their promises about more public participation and input,” said Lawrence Hamana, Hopi tribal member from Moencopi Village. He traveled from Phoenix to be at the Tuba City protest. A strong cross-tribal support system has gained much support between Hopi and Navajo tribal community members who are technology savvy and have finely honed research skills, which has built up a tight cross-tribal “Kill the Bill” movement. “It’s amazing what we can do in our own research for public documents, including information from Congress, with ‘Google’ and world web information at our fingertips. Public information is there for us as community members to check on environmental, science and federal, state financial information, we can quickly find out facts to help support our opposition to SB 2109,” stated one young Hopi tribal member from Hotevilla who was with his mom at the protest. Almost each evening, as tonight, our SCAIR Senior Advisor Randy Edmonds provides the blessing for the feast. Also, tonight most of our positive Soaring Eagle dance workshop elements of support are there for the benefit of the children: Elders. Inter-tribal drum and singers, dance mentors along with many community announcements, potluck: rice and meat, spaghetti in meat sauce, noodles with meat in red sauce and fresh strawberries. Later we had cookies, donuts, punch and hot coffee. And best of all, folks ready to have a good time doing this potluck thing for the children. Parent and friends participation are very important to the Tribal social aspect of the program success. 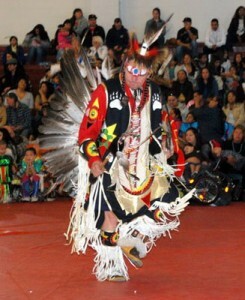 Remember to bring a potluck item or side dish for the Soaring Eagles dance workshop evening feast. It is our Traditional Indian way to practice hospitality and generosity when we invite all to attend an Indian gathering and share the meal with the whole community. San Diego Unified School District, SDUSD, Ballard Parent Center, 2375 Congress St. San Diego, CA 92110. 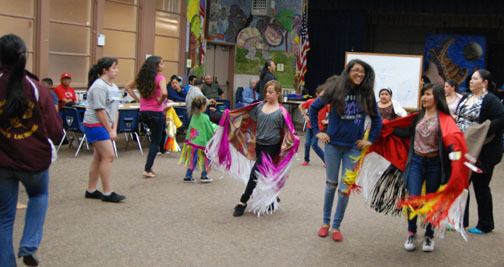 The Soaring Eagle performance dance group will be very active over the remainder of the 2012 spring: For Soaring Eagle, contact: Vickie Gambala 619-306-7318. SDSU Viejas arena at Aztec bowl April 19, 2012. Dalai Lama talks to the people. We have new families and old friends for a fine dance workshop this Wednesday March 28, 2012 evening. Past public performances at conferences and pow wows along with special invitations are a recent focus tonight. From beginning of the evening to the end the Soaring Eagle, parents and children invitation to be a part of the Native American April 19, 2012 presentation for the Dali Lama are part of the structure of the dance workshop. The special significance of the Dali Lama is brought out: For your information from the Roof of the World to the Land of Enchantment. The relationship between the Tibetans and the Hopi can be loosely examined but one can’t help but be overwhelmed with the similarities between the two cultures. Besides their common physical appearances, their braided hair for male and females, etc, the Hopi and Tibetan people share many more cultural similarities. Both cultures have extensive use of turquoise jewelry to ward off evil. Both cultures exhibit similar use of silver and coral, as well as similar colors, materials and woven patterns of their textiles. Since that initial meeting, the Dalai Lama has visited Santa Fe to meet with Pueblo leaders, Tibetan Lamas have engaged in numerous dialogues with Hopis and other Southwestern Indians, and now, through a special resettlement program to bring Tibetan refugees to the United States, New Mexico has become a central home for relocated Tibetan families. As exchanges become increasingly common between Native Americans and Tibetans, a sense of kinship and solidarity has developed between the cultures. While displacement and invasion have forced Tibetans to reach out to the global community in search of allies, the Hopi and other Southwestern Native Americans have sought an audience for their message of world peace and harmony with the earth. In the context of these encounters are the activities of writers and activists who are trying to bridge the two cultures. A flurry of books and articles has been published, arguing that Tibetans and Native Americans may share a common ancestry. The perception of similarity between Native Americans of the Southwest and the Tibetans is undeniably striking. Beyond a common physicality and turquoise jewelry, parallels include the abundant use of silver and coral, the colors and patterns of textiles and long braided hair, sometimes decorated, worn by both men and women. When William Pacheco, a Pueblo student, visited a Tibetan refugee camp in India, people often spoke Tibetan to him, assuming that he was one of them. As is the case with most Earth-based cultures with a shamanic tradition, some Native ceremonies contain spiritual motifs similar to cultures from around the world (hence the broad comparison made by Waters). This could account for some of the similarities seen between Tibetan and Native American spiritual practices, such as Navajo sand painting, and cosmic themes found throughout traditional Pueblo dances. But our hearts and the primary goal of the Soaring Eagle program are always the children. This dance workshops enthusiasm and quality is evident in the initiative, joy, pride of tribal identity and participation in the songs and dance categories. Each evening most of our positive Soaring Eagle dance workshop elements of support are there for the benefit of the children: Elders. Three drums and singers, dance mentors along with many community announcements, potluck: chicken, beans, spaghetti in meat sauce, spam, broccoli, green salad and rolls with butter. Later we had birthday theme cupcakes, chocolate cake, donuts, punch and hot coffee. And best of all, folks ready to have a good time doing this thing for the children. Parent and friends participation are very important to the social aspect of the program success. Remember to bring a potluck item or side dish for the Soaring Eagles dance workshop evening feast. It is our Traditional Indian way to practice hospitality and generosity when we invite all to attend an Indian gathering and share the meal with the whole community. San Diego Unified School District, SDUSD, Ballard Parent Center, 2375 Congress St. San Diego, CA 92110. Dali Lama talks to the people. All were well fed and ready to enjoy the individual recognition of each child’s participation in the Soaring Eagle program. On stage were two very large trophies for recent parade performances. There were touching and delightful moments and smiles as the children were offered opportunities to win extra prizes and many desert treats and snow cones. The evening was a total success! Everyone is welcome to enjoy the Soaring Eagle program. 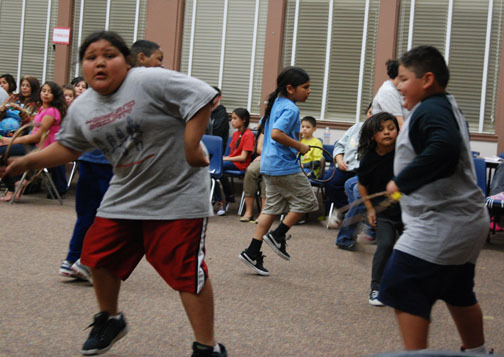 It provides Native American/Alaskan Native, K-12 students with an opportunity to learn traditional dance, regalia and respectful tribal customs. There are many entertaining and healthy activities for all ages and interests to enjoy. This evening SCAIR tutor, Jeanne Alvarado had educational booklets on: The St. Patrick Day Mystery and Why Can’t I? They were about children’s safety and behavior. 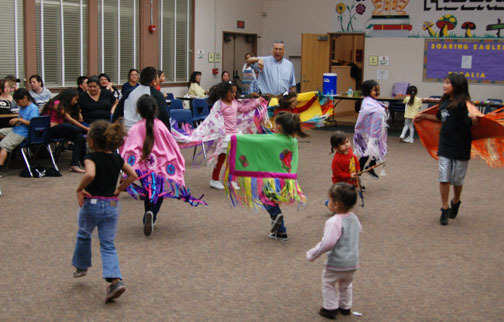 The Soaring Eagle American Indian Children dance program is located in Old Town in the Ballard Parent Center. It serves as the home of San Diego Parent advisory committee. This is where parents learn how to strengthen their parenting skills, become more involved in their children’s education and improve their ability to communicate with their children. 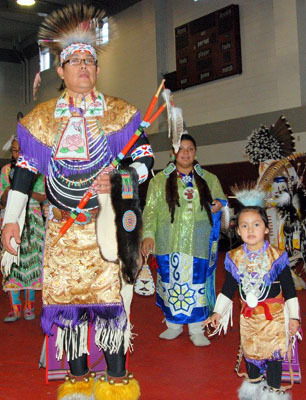 Finally, we all hope to see you and your family at the next American Indian community event. Rancho Bernardo Inn- 11th annual Wellness conf. Okla.
We had a fine dance workshop this Wednesday March 7, 12 night. But our hearts and the primary goal of the Soaring Eagle program are always the children. This dance workshops enthusiasm and quality is evident in the initiative, joy, pride of tribal identity and participation. 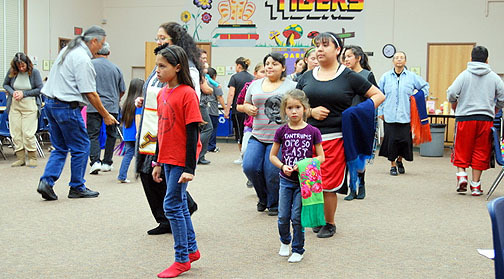 From beginning of the evening to the end the Soaring Eagle parent board, parents and children at the Soaring Eagles Dance Workshop are part of the Traditional American Indian community. We are all pleased that our Soaring Eagle dancer Dylan Allrunner, Cheyenne, as he was gifted a Southern Plains strait dance regalia. The outfit was made by David and Keri Gloria and gifted to him at no charge. Randy Edmonds announced that he would be formally brought into the arena at the San Diego State pow wow. Each evening most of our positive Soaring Eagle dance workshop elements of support are there for the benefit of the children: Elders. Singers, dance mentors along with community announcements, potluck: meat loaf, rice, green salad and pizza. Later we had Irish themed cupcakes and folks ready to have a good time doing this thing for the children. The primary goal of the Soaring Eagle program is the children. 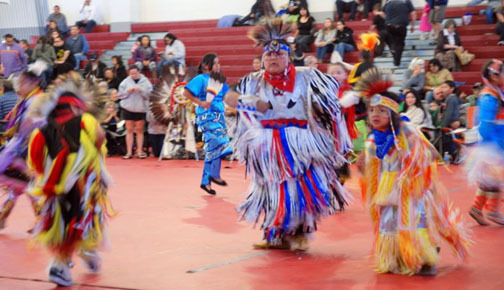 This dance workshops quality is evident in the initiative, joy, pride of tribal identity and participation, from beginning to end, of the parents and children at the Soaring Eagles workshop. This 29/2/12 Wednesday night most of our positive Soaring Eagle dance workshop elements of support were there for the benefit of the children: Elders, Boom box CDs, dance mentors along with community announcements, food and folks ready to have a good time doing this thing for the children. SCAIR Senior Advisor Randy Edmonds delivered the blessing for the food and asked for prayers for those whose relatives had passed on and for those in need of compassion and a kind word. For dinner there was enchiladas, rice, beans, green beans, pizza, salad. For dessert homemade chocolate cake. After the meal the board presented themselves to the Vickie Gambala, Christopher Scott, Vera Tucker, Carla Tourville, Richard Orvedal and Abel Jacome. They welcomed the new families present. 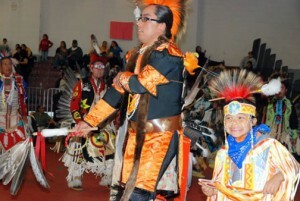 Chuck Cadotte (dance instructor) took the class back to the basics powwow 101. He instructed every category showing the kids dance steps. It was very nice to see this,seeing older ones mentor the younger ones. Kids were having fun.Old and young enjoyed taking a turn around the middle of the dance floor tonight. Class was relaxed and enjoyable,even though there was no drum we used a CD player. Parent and friends participation are very important to the social aspect of the program success. 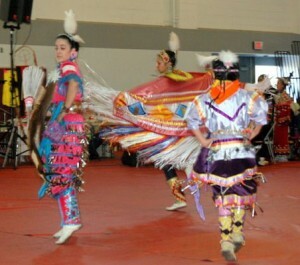 Remember to bring a potluck item or side dish for the Soaring Eagles dance workshop evening feast. It is our Traditional Indian way to practice hospitality and generosity when we invite all to attend an Indian gathering and share the meal with the whole community. 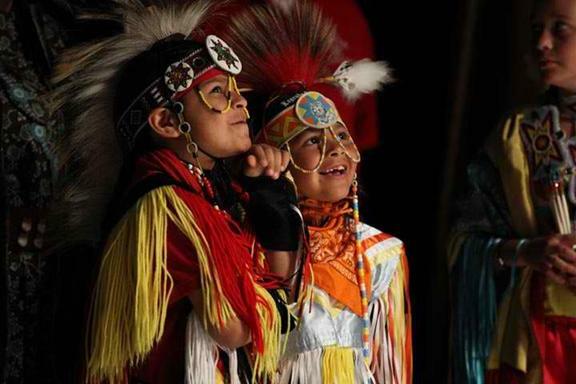 The Indian children are our Soaring Eagle workshop priority and our Indian culture future. 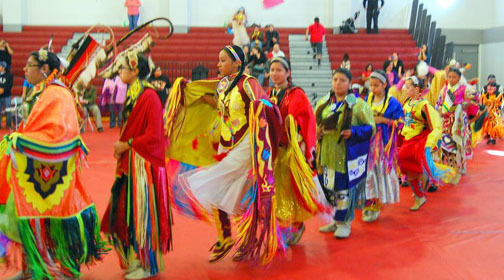 Come on down to the Ballard parent center for the pow wow dance, music and also enjoy the friendship of the winter 2012 Soaring Eagle gatherings. Finally, we feel very good that there is again with this first month of the New Year, a spirit of enthusiasm, harmony and balance. 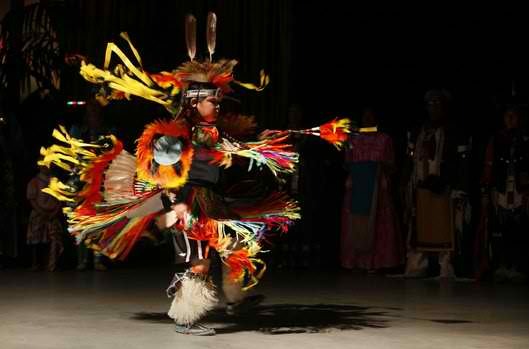 These are qualities that we will look and strive toward in the 2012 pow wow dance circle. San Diego Unified School District, SDUSD. Ballard Parent Center. We did not have a dance workshop this week. But our hearts and the primary goal of the Soaring Eagle program are always the children. Our plans for the next one are February 29, Wednesday. The leap day of the 2012 year! This dance workshops enthusiasm and quality is evident in the initiative, joy, pride of tribal identity and participation. 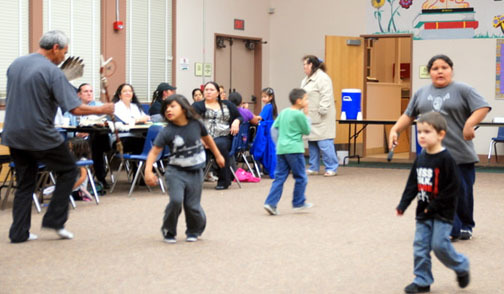 From beginning of the evening to the end the parents and children at the Soaring Eagles Dance Workshop are part of the Traditional American Indian community. We are all very proud of our Soaring Eagle dancer from the Abel Jacome family: Monica! She will be recognized at the Youth Center Community night on Friday night, 2/24/12. She was selected to be the Wild Horse Pow wow Princess for the next year, CONGRATULATIONS! Enjoy the pictures of her, the pow wow and our last SE workshop too. Each evening most of our positive Soaring Eagle dance workshop elements of support are there for the benefit of the children: Elders. Singers, dance mentors along with community announcements, food and folks ready to have a good time doing this thing for the children. We will not have a dance workshop this Wednesday night. But our hearts and the primary goal of the Soaring Eagle program are always the children. The next is February 23 Thursday, This dance workshops enthusiasm and quality is evident in the initiative, joy, pride of tribal identity and participation. 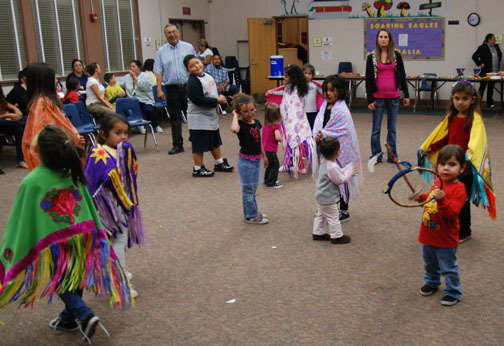 From beginning of the evening to the end the parents and children at the Soaring Eagles Dance Workshop are part of the Traditional American Indian community. We are all very proud of our Soaring Eagle dancer from the Abel Jacome family: Monica! 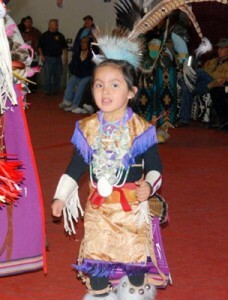 She has been selected to be the Wild Horse Pow wow Princess for the next year, CONGRADULATIONS! 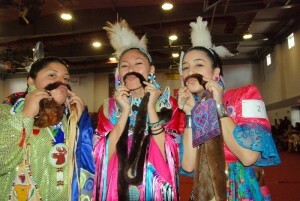 Enjoy the pictures of: her, the pow wow and our last workshop too. February 23 Thur., 29 Wed.